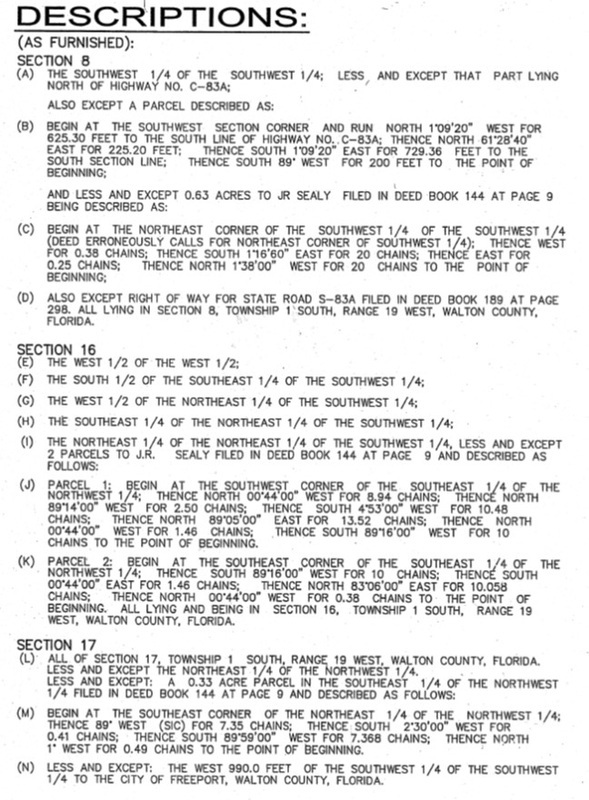 #3 No search of the public record was done by Emerald Coast Associates, Inc.
You would think that would be the first thing to do in a Government Township with no County Surveyor and at very least the Federal Field notes would be consulted and noted hereon as well. 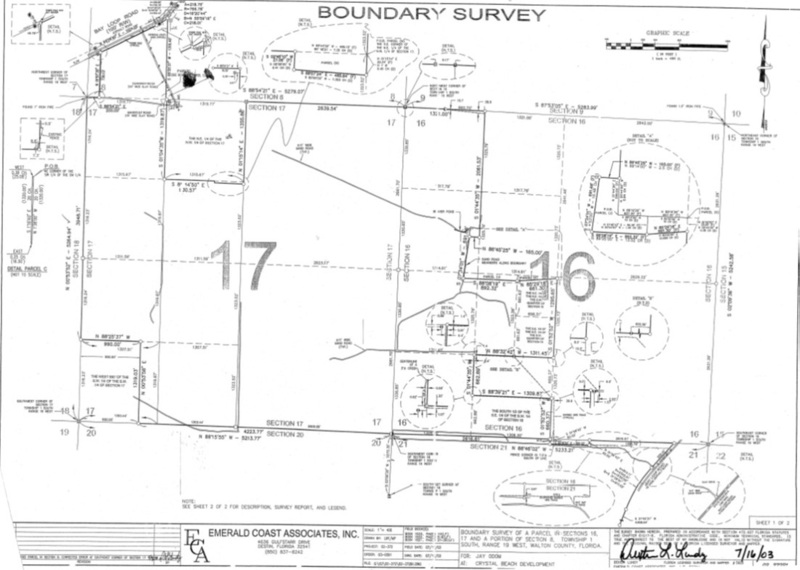 This would be important to prepare a proper Boundary Survey because the survey work is tied to the TRS Grid with the language of the deed which created the boundaries. Our fence is not shown, the dirt road is not shown, our fence, property line, house, business and surrounding forms of monumentation is not shown. But no certification is given that easements, deed overlaps, underground improvements or apparent uses do not exist. #4 Apparent uses are as shown. The enlargement below shows an area of blue and another of yellow. The blue area has our house, business shop, mother's mobile home and many storage buildings. The yellow area has our fence located on the southern line, our garden, and road to the back of our property. Both areas have many different types of monumentation from different surveyors over the years. The enlargement below shows the area of blue and yellow removed. The area has our house, business shop, mother's mobile home many storage buildings, our fence , our garden, a road to the back of our property, and many different types of monumentation from different surveyors over the years. None are shown as encroachments, or issues of concern. Page one in the “SURVEY REPORT” states at #4 “Apparent uses are as shown” So where is our home, our business, our fence, monuments, etc.? The neighbors fence is shown. The "unknown" parcel moves from the proximity of our land to a different location onto our neighbors land. At the right hand corner, find the section line that departs from the Southeast corner of Sections 16,17,22, & 21. This monument is reported as an ACC 5”X 5”. NOTE: This monument is at the top of, or most northerly point of, the line of five “PRMs” or “Placed Reference Monuments” that were set by ACC in 1953-4. The placement of ACC monument location was challenged in 1957 in the Armstrong Cork Company vs. Silcox/Thomason case. The judge found that the ACC monument was not in the correct place. In our case, the judge found that an ACC monument was in the correct place. It is also important to note that the official field notes from the Government Survey indicate that only cardinal bearings were used, this means due north, due east, due west, due south, when the TRS grid in 1 south 19 west was established. there is no report of the distance from the start point to this location and no indication of any other monumentation found. Continuing, we are told, for a distance of 1393.78’ to the next open circle or indication that ECA set an iron pin again and there is no report of any other form of monumentation found at this location. 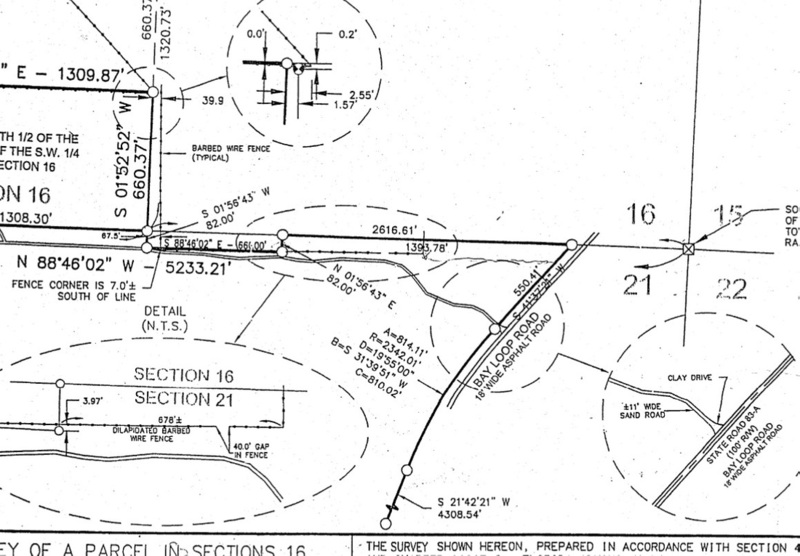 This is the location of the NE corner of the “new” 82’ X 660’ Less & Except rectangle, here ECA indicates it set three iron pins, one on each of the four corners of the new location for the 82’ X 660’ rectangle. ECA reports that the line we are on is 2616.61’ long to this point. Moving west we depart the ½ mile point and proceed through the ¼ mile point where ECA reports that it did not “SET” an iron pin for a reported distance of 1308.30’ but found no other monumentation. Moving west we depart the un-monumented ¼ mile point and proceed a reported distance of 1308.30’ to the location of a “4 X 4” Broken Concrete Monument with No I.D. Number” and no other monumentation. Departing this location the bearing changes to N 88*15’55”w, and we know that these two lines are not straight because the direction we are proceeding along has changed at this point. Moving on west along this new bearing we pass though the ¼ mile point where ECA indicates it does not “SET” an iron rod and did not find any other monumentation. We continue for an other ¼ mile where we discover that ECA has “SET” a 4” X 4” concrete monument at the reported ½ mile point of Section 17 for a total reported distance of 2506.89’. Departing this location and moving west we pass through the suggested ¼ mile point reported to be 1303.44’ but where ECA indicates it did not “SET” and iron pin or find any other monumentation. We continue for an un reported distance where we encounter an open circle indicating that ECA “SET” an iron pin. Continuing for a distance of 990.00’ where we encounter a 5’ X 5’ ACC concrete monument reported to be the Southwest corner of Section 17 and no other monumentation and the end of this line. In a Government Township where subsequent surveyors are required to re-trace the original foot steps of the TRS Grid, ECA seems to be “SETTING” a lot of new pins and new monuments and not finding very many previous pins or monuments. This is because ECA is on the wrong line and unable to find previous monumentation. ECA is also unwilling to report monumentation all around the area of our property. 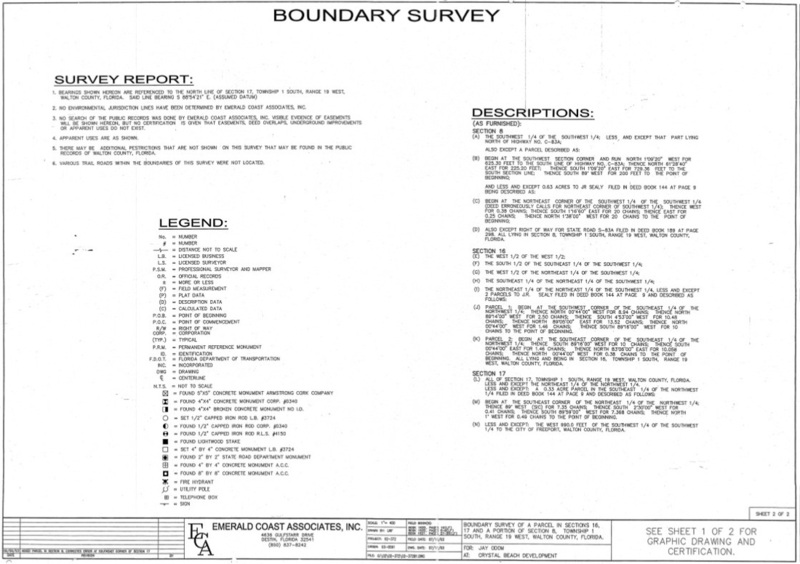 When ECA's measurements are compared to the GLO field notes, the measurements and bearings do not match or even remotely come close. ECA states that it did not search public records, or even the Government field notes. 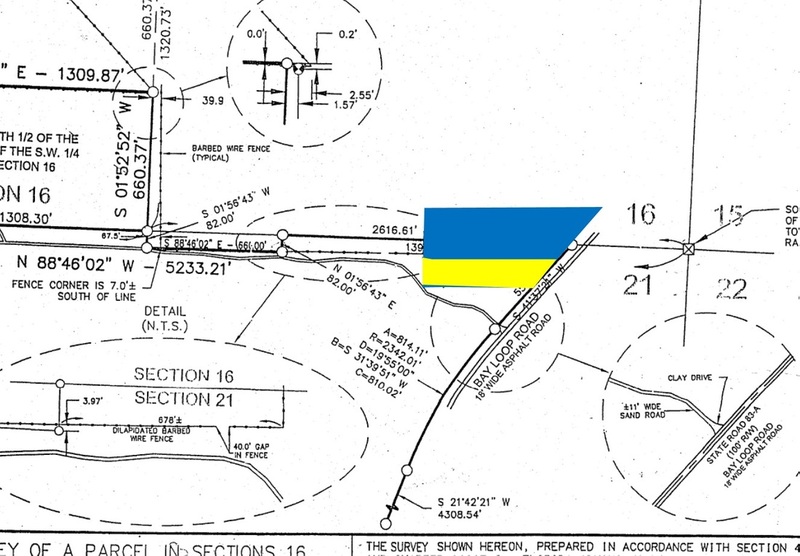 The original field notes indicate that the South Line of Section 16 is 80 chains or 5280 ft. long and the south line of section 17 is also 80 chains or 5280 ft. long. ECA reports that Section 16 is 5233.21 ft. long and that Section 17 is 5213.77 ft. long. Therefore ECA is 46.79 ft. short in Section 16 and 66.23 ft. short in Section 17. Together ECA is 113.02 ft. short in distance east to west, on the wrong bearing, and starting at the wrong location. Based on the discrepancies of measurements, we were able to calculate the area where a surveyor should be looking as opposed to the area that falls short of the GLO field notes. Our calculation was 108' west and 38' south of the ACC monument used by ECA for the SW corner of Section 17. In 2008, surveyor Brian Pascoe was able to find an original light wood stake approximately 98' west and 28.5 ' south of the ACC monument used by ECA, as well as evidence of all 4 original witness trees. The stake was confirmed by a second surveyor coming from a different direction in 2014, and Brian Pascoe was tasked by the State of Florida with placement of state issued monumentation at the location of the light wood stake. This is why a County Surveyor is fundamental to the perpetuation of the TRS Grid with good and proper management, as originally required by Law. In the image below, The green line is the line that ECA claims is the Section Line. The blue rectangle is the new location for the "Less and Except” in the west that was not mentioned on page one under the “Descriptions” heading. The area shown in red is the approximate location of our property. Notice the orange star that is the fence corner that was described as the locally accepted corner in the two surveys from Choctaw 1980 & Baskerville-Donovan 1993. ECA does not indicate any other found monumentation to the east of the fence post other than the SE corner of Section 16 shown as an ACC monument). We found and documented eight monuments in that area along with an iron pipe w/ brass head monument so far south that all surveyors are discounting it. A light wood stake was discounted in the ACC vs Silcox because it was so far away from the ACC monument as well. The iron pipe with brass head is significant to the issue at hand, as it more closely aligns with our fence and is located south of the junction of Four Mile and Lafayette Creeks, as originally surveyed and shown by the GLO. While researching the Plat Books of the public records, we found a survey in South Walton that identifies an iron pipe with brass head as placed by the USGS. The USGS came through the area in the 1960's for the creation of the 1970 Quadrangles as part of the BLM (earlier known as the GLO). The pipe in our area in located in a road and shows signs of an attempt to remove it from the asphalt. It also has been bent at the top at a 90 degree angle so any writing that might be on the brass cap can't be viewed. Our fence, the brass capped pin, and the 10 acres connected with Daniel Jackson on the other side of Four Mile Creek, all align within reason to the original survey from the GLO. The newer grid established by the County Surveyor going the wrong way, and supported by ACC attempting to follow the County Surveyor represents about a 400' difference in our area between the original footsteps and the new footsteps. The problem is not as bad at the west end of the township, but becomes much worse at the east end of the township.